This article is about the quest. For other uses, see Dawnguard (disambiguation). Speak with the leader of the Dawnguard. Hear about the Dawnguard vampire hunters. Speak to Isran and Vigilant Tolan. 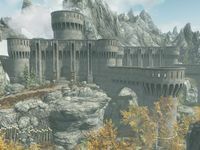 Upon installing the Dawnguard add-on, you may hear a new rumor from city guards regarding the Dawnguard: "Heard they're reforming the Dawnguard. Vampire hunters or something, in the old fort near Riften. Might consider joining up myself." If this is the first you've heard of the Dawnguard, your map will be updated with the location of Fort Dawnguard, and the quest will officially appear in your journal. If your level is 10 or above, whether you've heard this rumor or not, an Orc named Durak will find and approach you with a proposal to join the Dawnguard: "You there. The Dawnguard is looking for anyone willing to fight against the growing vampire menace. What do you say?" 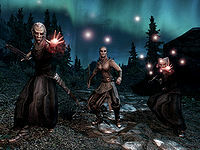 The miscellaneous journal objective "Find out about the Dawnguard" will appear, and if you ask him to explain, he'll tell you that they are a group of vampire hunters. He'll mention that the Hall of the Vigilants was destroyed by vampires because the Vigilants didn't take the vampire threat seriously. If you ask him what he's talking about, he'll tell you they got torn to pieces when they went up against the vampires, and that's why his leader Isran is reestablishing the Dawnguard. When you ask how to sign up, Durak will tell you to talk to Isran at Fort Dawnguard, southeast of Riften. If you didn't hear the rumor from a guard already, your map will now be updated, and the quest will officially appear in your journal. If you happen to tell Durak you're not interested in being recruited, he'll say "That's what everybody says, right up until they find their throat being ripped out by a pack of hungry vampires." and the conversation will end. If you approach him a second time, he'll respond "Yeah, you change your mind? The Dawnguard could use somebody like you." and the other dialogue options are the same as the first time around. If you tell him you're not interested this time, he'll tell you to talk to Isran and give you the location of Fort Dawnguard anyway, in case you change your mind. Alternatively, you may start this quest in another manner, detailed below. Take the road that leads east from Riften. Right after the road turns southeast and you cross a small bridge, start watching the cliffs to your left. You'll find a small crack in the side of a cliff—the entrance to Dayspring Canyon. It's found between a hollow green log and a broken birch tree. A narrow, winding path leads you towards Fort Dawnguard. It is the only way to reach the fort until you discover the map marker. Along the way, you may catch up to Agmaer, another new recruit to the Dawnguard. If you haven't yet heard about the Dawnguard, his greeting will trigger the quest to appear in your journal: "Oh, hey there! You here to join the Dawnguard, too?" He expresses his anxiety concerning entering the fort on his own, and accompanies you the remainder of the way. He asks you not to mention his nervousness to Isran, but will make several comments expressing his low self-confidence as you make the walk. Despite his expressed fear of going in on his own, he will run inside the fort without waiting for you if you don't enter immediately after reaching the front steps to the entrance. You may pass Durak just outside the fort, practicing his skill with a crossbow. If you ask him what he's using, he'll answer "Never seen a crossbow before? Not surprised. Kind of a Dawnguard specialty. Nothing better for putting down vampires." He will then give you your own crossbow, along with 45 steel bolts (see notes below for how to get a second one). When you reach the steps to the fort, you'll find Celann guarding the entrance. If you choose to speak with him, he'll say he was surprised to hear from Isran at all, and comment that things must be pretty bad for Isran to request his help. If you ask Celann about working with Isran in the past, he'll tell you they were both members of the Vigilants of Stendarr, whose "hearts were in the right place" but left them both dissatisfied. The pair left together, but Celann didn't agree with Isran's "methods", so the partnership didn't last. On that note, he'll tell you "Go on inside, Isran will want to talk to you." "You need to concentrate, boy. Try it again." Once inside, you'll find the Dawnguard leader, Isran, speaking to Tolan, a priest of the Vigilant. Isran: "Why are you here, Tolan? The Vigilants and I were finished long ago." Tolan: "You know why I'm here, the Vigilants are under attack everywhere. The vampires are much more dangerous than we believed." Isran: "And now you want to come running to safety with the Dawnguard, is that it? I remember Keeper Carcette telling me repeatedly that Dawnguard is a crumbling ruin, not worth the expense and manpower to repair. And now that you've stirred up the vampires against you, you come begging for my protection?" Tolan: "Isran, Carcette is dead. The Hall of Vigilants... everyone... they're all dead. You were right, we were wrong. Isn't that enough for you?" Isran: "Yes, well... I never wanted any of this to happen. I tried to warn all of you... I am sorry, you know." At this point, Isran will turn to you, asking "So who are you, what do you want?" You can tell him you're just looking around and ask about the fort, to which he'll reply, "Why do I even post guards? This is the headquarters of the Dawnguard. Well, it used to be, a long time ago." If you tell him you've come to join the Dawnguard, or simply that you've heard about the vampire hunters, he'll be pleased that you're interested but comment that most of their work at the moment is going toward restoring the fort. When you ask how you can help, he'll respond "I need someone out in the field, taking the fight to the damn vampires, while we're getting the fort back into shape. Tolan was telling me about a cave some of the Vigilants were poking around in. Seemed to think it was..." and ask Tolan to tell you about Dimhollow Crypt. Tolan will inform you that "Brother Adalvald was sure it held some long-lost vampire artifact of some kind. We didn't listen to him anymore than we did Isran. He was at the hall when it was attacked..."
Isran will then assign your first task to you: "Go see what the vampires were looking for in this Dimhollow Crypt. With any luck, they'll still be there." and then invite you to explore and take anything you need from Fort Dawnguard. Before you leave, Tolan will offer to meet you at Dimhollow Crypt, saying "It's the least I can do to avenge my fallen comrades." Isran and Tolan will argue a bit, as Isran doesn't believe the Vigilants are trained for such a mission, and Tolan is offended at the implication that Isran thinks the Vigilants are soft, cowardly, and weak. He will stand by his decision, though, telling you "I'm going to Dimhollow Crypt. Perhaps I can be of some small assistance to you." 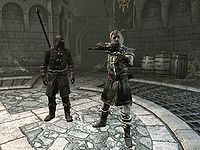 Isran will then give you a crossbow and some steel bolts (if you haven't received them from Durak already), saying "Here, you should take a crossbow. Good for hunting out those fiends before they get too close." and send you off on your mission. The quest Awakening begins immediately. After beginning this quest, the Hall of the Vigilant will be destroyed, regardless of your level. The hall can be reverted to its original form by opening the console and entering the code "xx003531".enable. You can bypass this quest completely and start Awakening without this quest ever appearing in your quest journal. In order to do this, you must not have received information about the Dawnguard from a guard or Durak upon entering Dayspring Canyon. Then, be sure not to come within close range of Agmaer between entering Dayspring Canyon and approaching Fort Dawnguard. When you enter the fort, the quest-related events will still occur in the same manner, even without the quest being started. If you've already received a crossbow from Durak, you can give it to a follower before talking to Isran. He will then give you a second crossbow and 45 more steel bolts. On some occasions, the quest marker both on your map and on your compass will not point in the right direction. This is due to the marker being associated with the wrong door for Dayspring Canyon. Members of the Dawnguard may attack you if you have lycanthropy. Reload a previous save, use beast form, and wait until it expires. Then proceed to Fort Dawnguard. 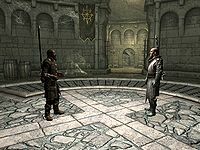 If you have attacked, and/or possibly killed, any Vigilants of Stendarr prior to entering Dayspring Canyon, all Dawnguard members might be hostile, preventing you from ever joining, as the Dawnguard and Vigil of Stendarr are allied factions. 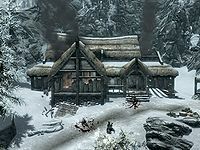 It may be possible to bypass this by avoiding any hostile interactions with Vigilants of Stendarr. The next quest, Awakening, may not trigger upon completion of this quest. ? Waiting 15 minutes of real time may fix this. A commonly cited workaround is to skip the quest entirely. However, this causes quests later on to break. This quest may fail to work correctly (such as Agmaer not greeting you, Isran and Tolan not engaging in conversation upon entering Fort Dawnguard, or not initiating Awakening). This may also happen on all subsequent new games. ? A complete reinstall of Skyrim may fix it. Durak may approach and walk in circles, preventing dialogue. He may remain stuck in place indefinitely. ? Use the console command setstage DLC1VQ01MiscObjective 10. After that, normal dialogue is possible. This option sometimes leaves the quest entry blank in your journal, however. An alternative option is to move Durak to you using the following: prid xx015c16 then moveto player. He then seems to start the quest normally. If you have a bounty in Riften, the members of the Dawnguard may be hostile, upon meeting, preventing joining. To avoid this, take care of the bounty before entering Dayspring Canyon. ? 10 I've learned of a group of vampire hunters known as the Dawnguard. It seems they are looking for new recruits. The following empty quest stages were omitted from the table: 5, 20, 50, 80, 100, 110, 115, 120, 130, 140, 150, 190, 200, 250. On the PC, it is possible to use the console to advance through the quest by entering setstage DLC1VQ01MiscObjective stage, where stage is the number of the stage you wish to complete. It is not possible to un-complete (i.e. go back) quest stages, but it is possible to clear all stages of the quest using resetquest DLC1VQ01MiscObjective.